Liew is on a team comprised of four new media artists of different nationalities (Taiwan, Malaysia, China). Their fields of expertise include interactive programming design, digital music, visual design, animation effects, interactive installations, interdisciplinary art, and more. Currently, all members of the team are studying at the Graduate School of New Media Art at National Taiwan University of Arts, where they work with other creative members of Pey-Chwen Lin Digital Art Lab. Under the guidance of Professor Pey-Chwen Lin, the team has been participating in important exhibitions and competitions both in Taiwan and abroad. For the work, CYCLE, viewers can pluck the interactive kinetic instrument to instantly compose music and produce clefs on the projection screen. The clefs on the screen appropriate from the ancient clefs used in Gregorian Chants of the 15th century. Composed of these ancient clefs and tabs, each note is presented through squares, belonging to unaccompanied monophonic music clefs. 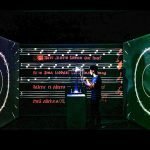 The interactive mechanical instrument creates clefs using Arduino, Adafruit, Processing, Max/MSP, Bluetooth, LED, 3D printing, acrylic, and metal tubes, enabling viewers to instantly play the instrument on-site and create various clefs. The music generated is instantly converted into the correct clefs, which are projected onto the screen. 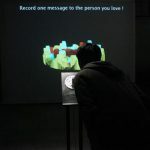 When there are no viewers present, it will automatically play and present the sounds and clefs previously created by viewers, expressing the digital aesthetics of interactive technology art and collaborative creation, and imbuing digital kinetic instruments with more cultural and musical qualities.